This new 2-sided felt has two layouts for the popular casino games "Caribbean Stud" and an instructional layout for "Texas Hold'em". One of the most popular Officially Authorized Home Casino Game Sets, Caribbean Stud is a registered trademark; it's game system is patented and bothe are used under the exclusive license from Mikohn Gaming Corp, Las Vegas, NV.The layout is 48" x 28". 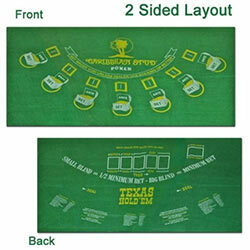 It can easily be stapled to a homemade table and be used as a traveling game for parties.Quality casino green felt with multi-color silk-screened graphics.